for higher power, higher currents to motor. For reference reasons its available at this stage. 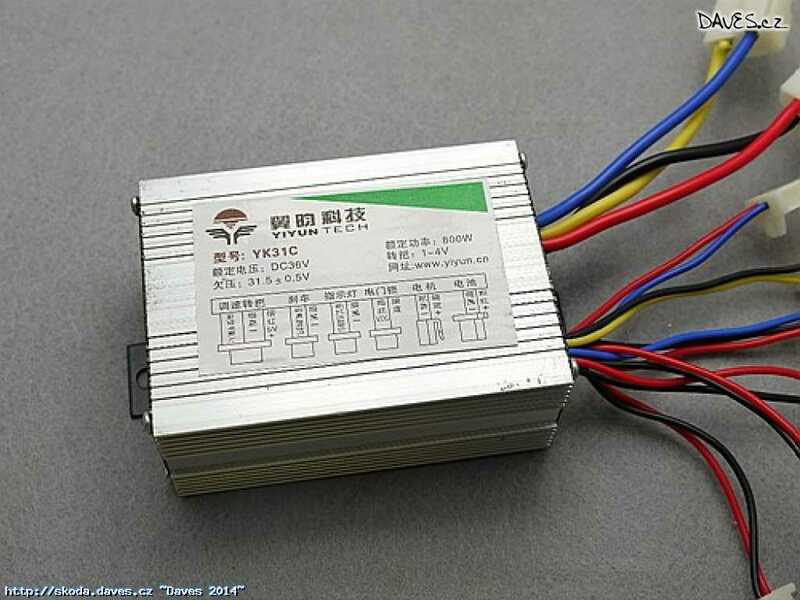 Basically YK31C is PWM controller for brushed DC motor with low voltage protection and current feedback limit. 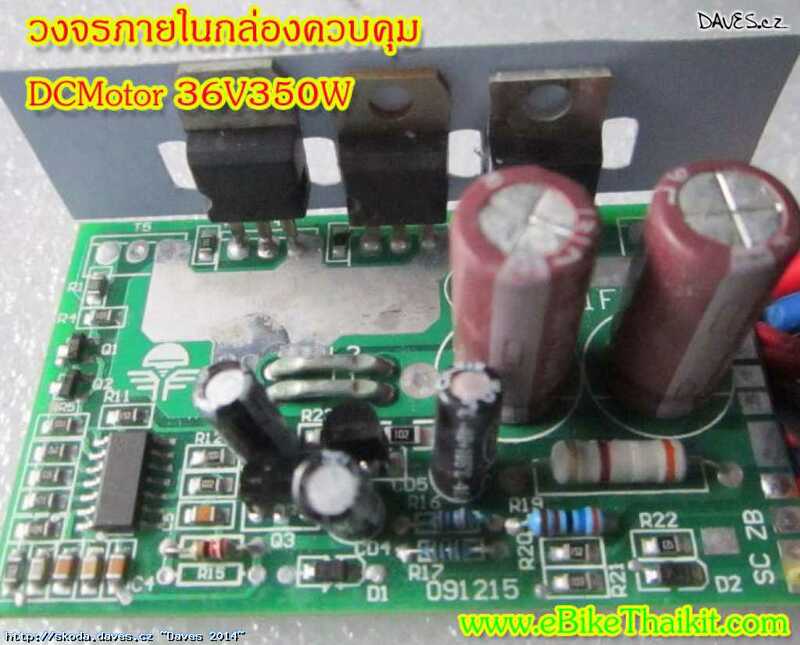 Core is triangular generator, which is combined with throttle level into PWM modulation. To be able to control the current flowing through the motor, there is pair of shunts (looking as U bent wire). 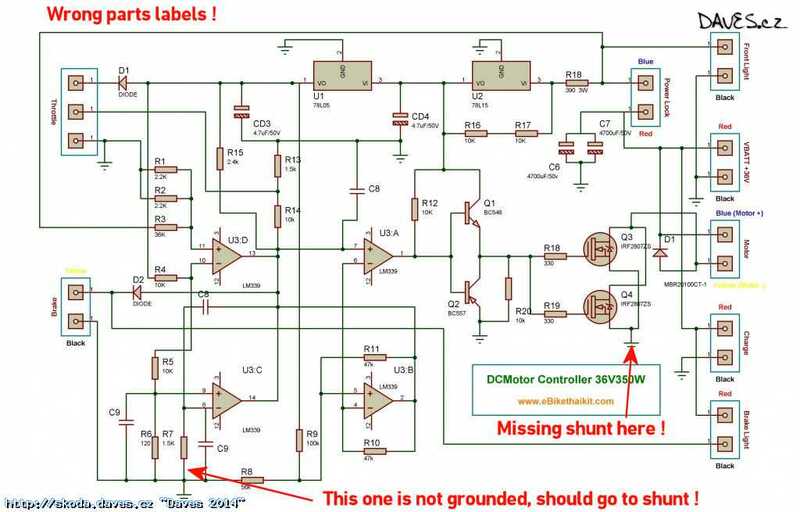 In fact shunt isnt just wire. 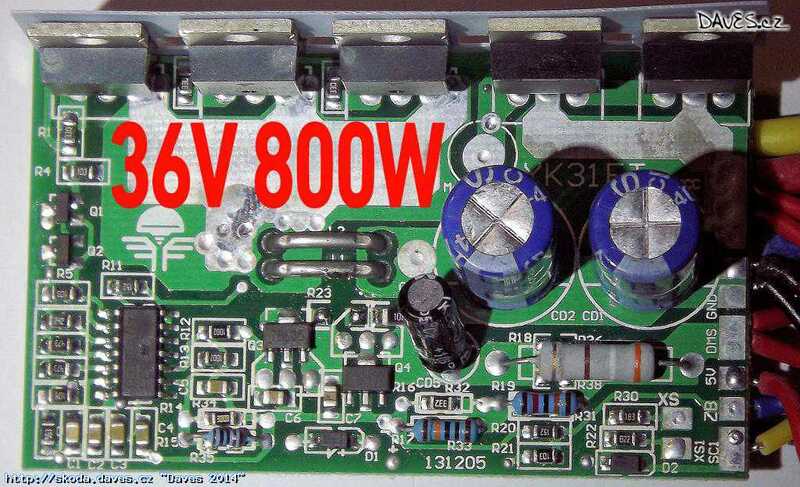 It has some amount of very small resistance, but together with high current it will generate some voltage on it. 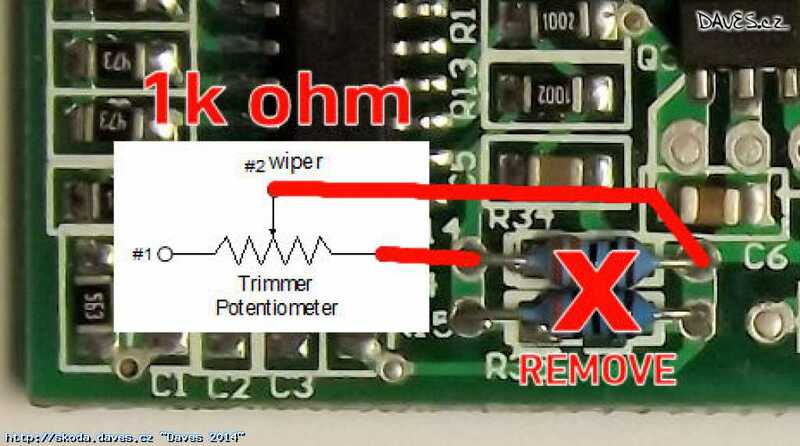 Ohm law says voltage = current * resistance. So the higher resistance or current is, more voltage is gathered. 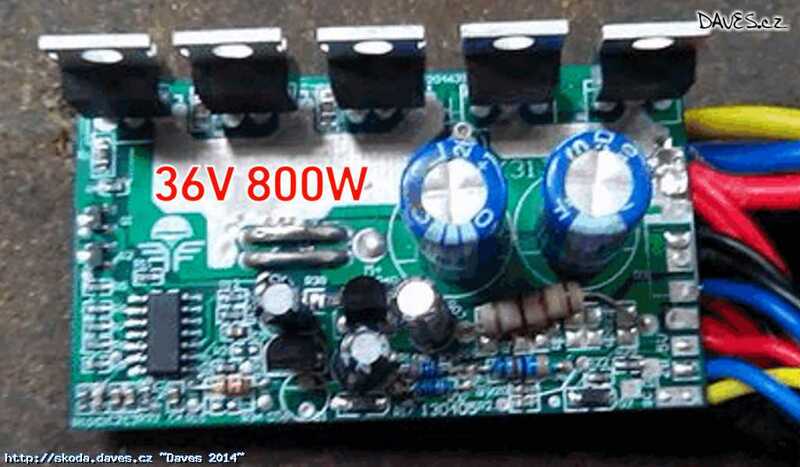 This voltage is fed into comparator which compares its value with preset value. If its higher, it will kill the output. 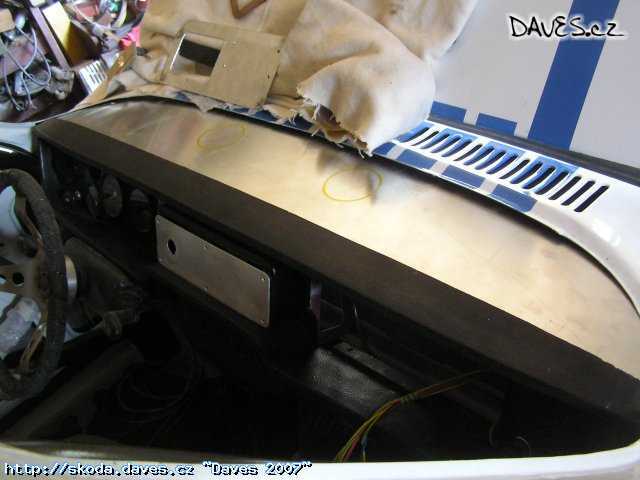 This way controller adjust the output current. Why to make a mod ? I didnt plan to mod it first. 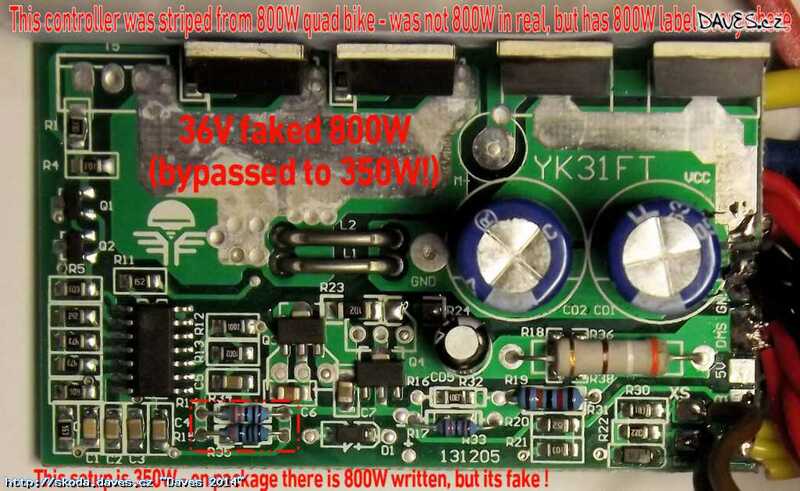 But I bought 800W quad bike for my kids and wait - It has 10A fuse while it has 36V battery. Something is wrong here ! 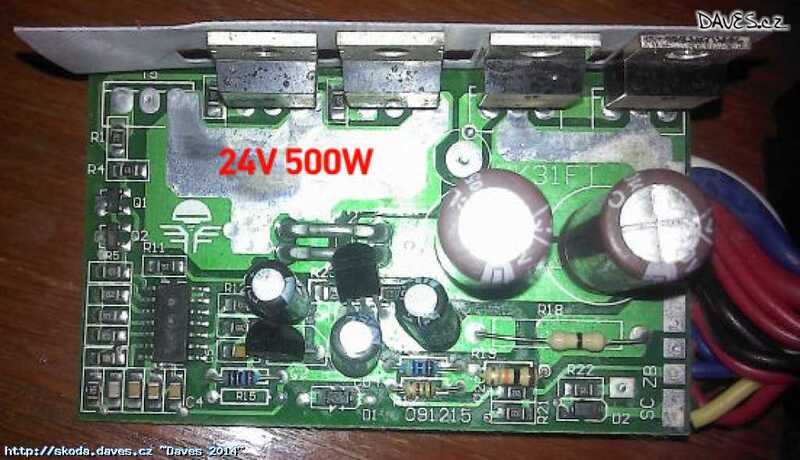 Simply 10A * 36V = 360W, if you try to put more, the fuse will blow. So that mean the quad bike isnt 800W at all. Even when labeled so on motor, on controller, in papers. Not really 800W. That was the time, when I started to search internet for scheme. Maybe I can fix it, right ? Lets get what I paid for ! In fact you can also push more power from any version. Mod 250W to 350W or even 500W or yet more... sounds pretty good, does it ? What I found was lots of garbage. 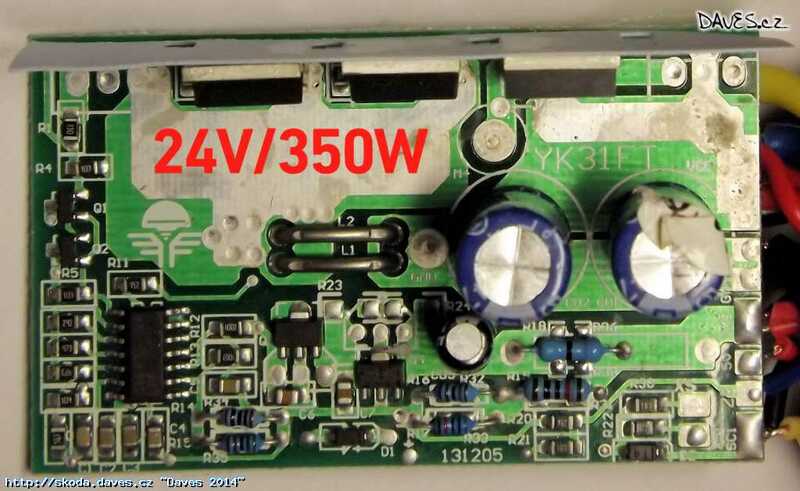 Not much info about YK31C controller out there. Schemes are missing parts, has wrong values and wrong labels. Did not help much. How can I modify something, if I do not know what to focus on ? 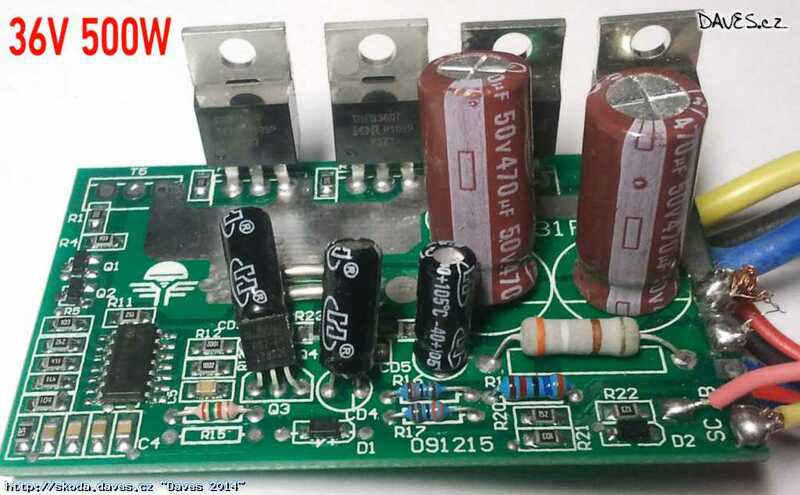 So I started reverse engineering and converted pcb into circuit. Now it makes a sense. Much more clear what is happening there. Here goes how the circuit is working. Part about triangle generator, followed by modulator and low voltage protection. 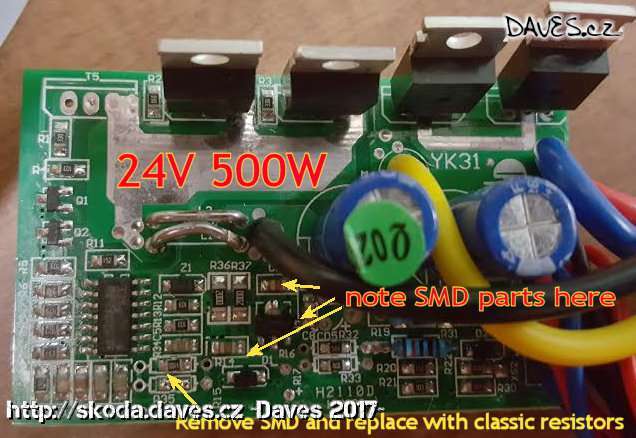 Not so important for modders who do not care about circuit idea. Yellow is input voltage (motor current) on 339/3, blue is pwm output x10. I found at least four ways how to power enhance the controller. Shunt mod is the easiest one. 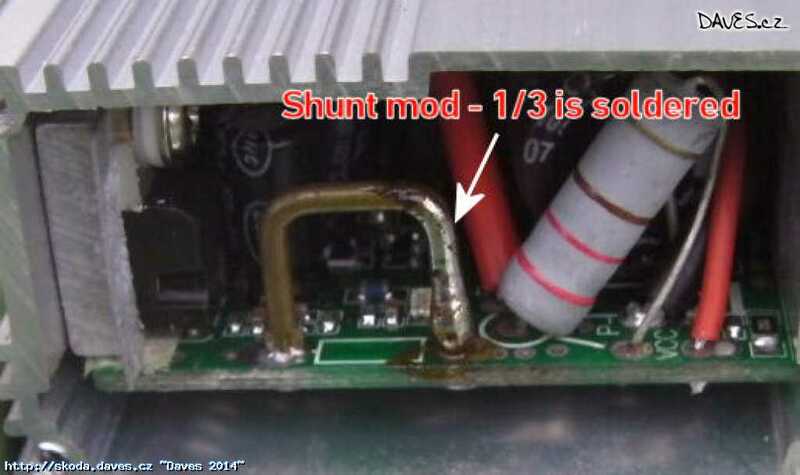 You need just to solder 1/3 of shunt. 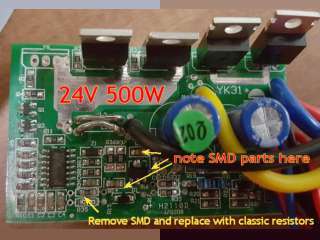 That will decrease its resistance, so less voltage will be generated. Remember the ohm law: voltage = current * resistance. We have same current, but less resistance. It means less voltage on output. So we can allow more current with lower resistance to fit into same voltage. Problem is, its very bad controllable. No fine tune at all. Hard to preset. 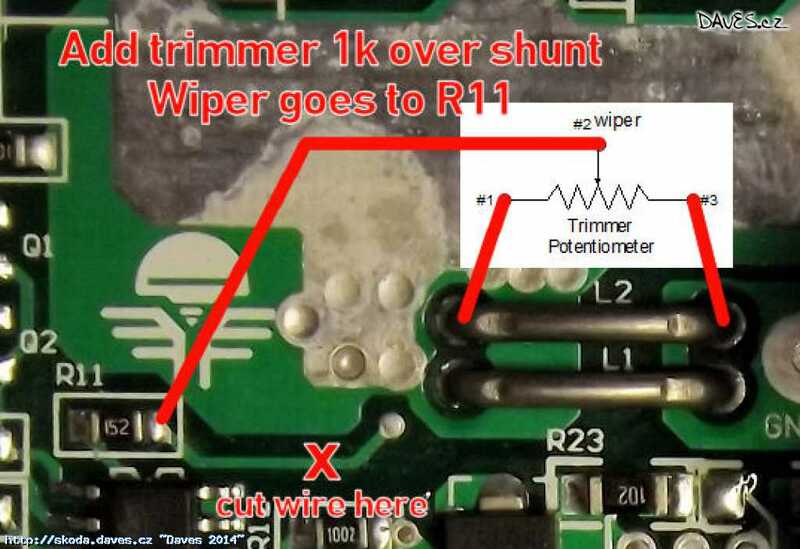 If you cut the wire between R11 and shunt, and replace with 1k trimmer, you can fine tune the output power. From OW to maximum. Just be careful - current drivers and also the motor has its limits. Will burn out, when you try to apply too much power. This one is very similar to previous one. Just you did not fake the feedback and instead of you modify directly the reference point. Also this will allow to fine tune from 0W to max, so take care. If you plan one time change, you can use table below and replace resistor with new value.